This project is a collage of embroidery hoops accented with felt flowers. 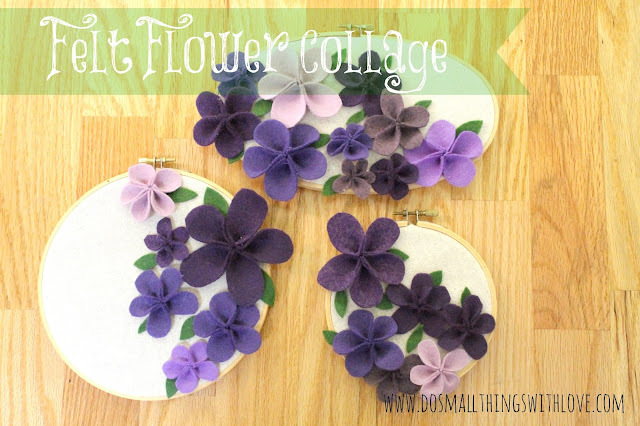 Together with these simple felt flowers they make beautiful wall decor. And, here’s how ya do it! Felt–purple for flowers and green for leaves. The How To here is pretty easy. The only thing that might need some explanation is the flowers themselves. For making the flowers, first cut 5 pedal shapes, with a rounded top and flat bottom. Then, take your needle and thread and stitch one long stitch through the bottom of each pedal. Do this through each pedal, making sure as you go that all of the pedals are laying the same way. Next, go back to the first pedal and stitch through that once again. This will create a loose loop of pedals. Finally, gently pull the string tight. This will fold each pedal in half. 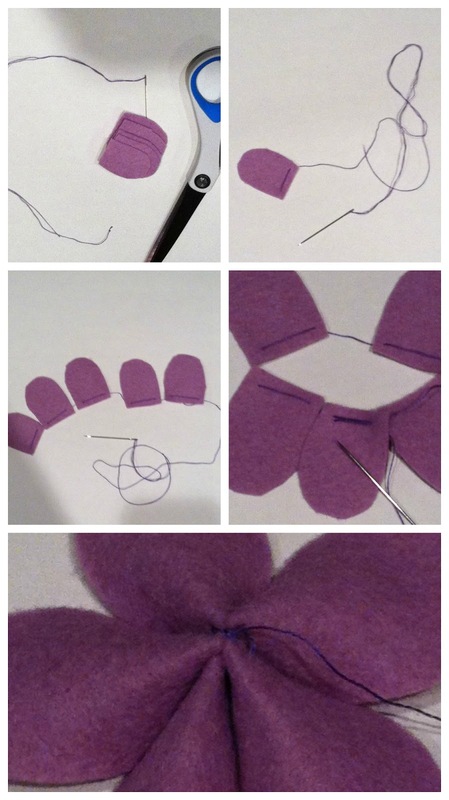 Once you are satisfied with how the flower looks, stitch through the back until it is held firmly in place. From here the project is simple. Repeat the process making flowers until you have the desired amount. Then, cut some leaves out of green felt. 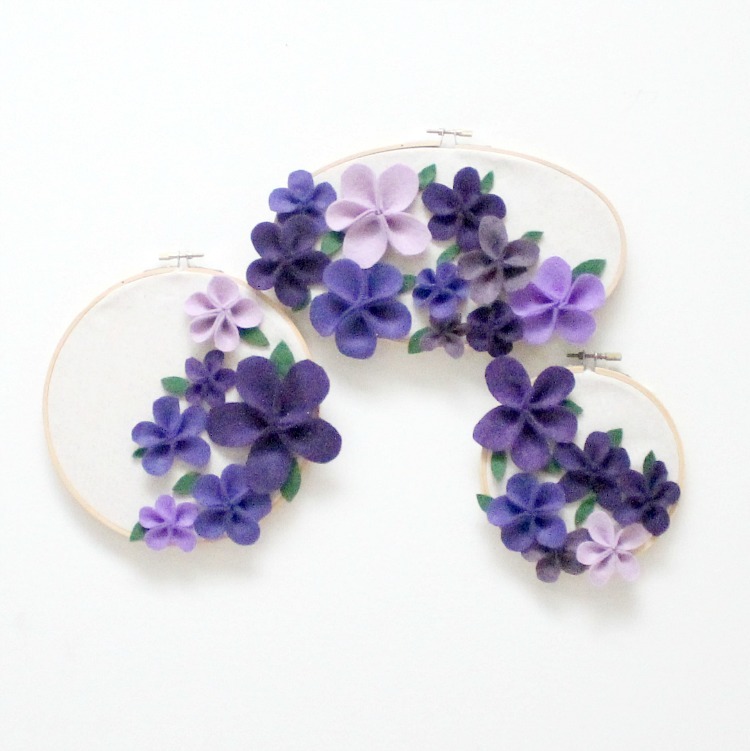 Arrange the flowers and leaves on the three embroidery hoops and glue everything down with hot glue. It’s a simple project with high impact! Thanks–I really love how mine looks in my home. These are gorgeous!! Thank you so much for sharing! Another beautiful project. I have a collection of embroidery hoops but I have never seen an oval one. I have quite a selection of felt as well so I am good to go for this project. I pinned this for later ( http://pinterest.com/pin/35184440812019053/ ). I went to a dollar store for embroidery thread (for the bird I pinned) but didn’t like the colours. They seemed ‘muddy’ to me. I will try again.